Here is my list of famous cats in the White House. These cats had Presidential clout, diplomatic appeal, and were, for a time, the most powerful cats in the world. In all, 11 presidents have had cats: Lincoln, Hayes, McKinley, Teddy Roosevelt, Wilson, Coolidge, Kennedy, Ford, Carter, Clinton, and George W. Bush. Roosevelt had cats named Tom Quartz and Slippers, Kennedy had Tom Kitten, Clinton had Socks, and the Bush's had India. Abraham Lincoln was reported to play with a kitten to burn off stress. He also saved some stray cats during the American Civil War while visiting General Grant's camp. A Presidential kitty cat rescue! Misty Malarky Ying Yang was a Siamese cat who belonged to Amy Carter, daughter of President Jimmy Carter. President Bill Clinton allowed First Cat Socks free reign at the White House. 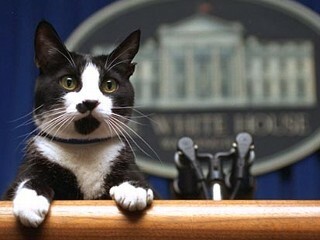 The White House was (scarily) "catless" for 12 years until Socks the cat came in and transformed the country. Socks, a tuxedo cat (black-and-white) was given to Bill Clinton's daughter, Chelsea, by a friend from school. He was just a kitten then. Socks rose to power after the election and had his own fan club and newsletter. As far as I know, he was never known to have an inappropriate relationship with anyone. President Calvin Coolidge had three cats. Their names were Timmie, Tiger, and Blacky. Timmie taught foreign relations to the country by allowing Caruso, the White House canary, to walk up and down his back and sleep between his shoulders. Tiger had a tendency to wander. Tiger ran off one day and, after some help from a local radio station, was found at the Navy building. After all, he was the Commander in Chief's cat. The first Siamese cat to arrive in the US, named Siam, belonged to President Rutherford B. Hayes. She was a gift from a US diplomat at the consulate in Bangkok to Lucy Hayes, the First Lady. Unfortunately, about a year after she arrived in America, Siam became extremely ill. Despite the efforts of the President's personal doctor, the illness was too much for her, and she passed away. Susan Ford, daughter of President Gerald Ford, had a beautiful Siamese cat named Shan. Morris the Cat from 9Lives fame ran for president twice, once in 1988 and again in 1992. Bill the Cat from the comics Bloom County and Opus also ran for president twice. The first time, he managed to run while deceased. Bill died in a car crash when his Ferrari hit a cactus, but then later he was brought back to life through the cloning of cells from his tongue, which was recovered from the crash. He lost his second bid for the nation's top office when he threw up a fur ball on Connie Chung.